The NY Times’ James Estrin has gone and done it now. He has made up for his (in my mind) less than kind assessment of Diane Arbus’s work with a piece today that gives the proper perspective on this truly amazing 20th century photographer. But some of the thoughts expressed in this article really hit home for me. In many ways I have felt locked up in a world of photography as it is viewed and presented today, by voices that frown upon unflinching images of America and the conditions of life here. Images that are taken, and not made, (more on that in a second) and clearly without permission. So I’m going to be presenting some of that on this photoblog in the very near future. More often than not, Arbus had permission from her subjects. But, as Joan Didion once alluded to about herself and the subjects of her writing as she encountered them, we can be pretty sure the subjects of both of these unflinching documentarians had no idea how graphic the end result would turn out to be. In the case of Arbus, it has been the source of great criticism of her work. For me, however, I believe you can’t argue with what we are left with in terms of the impact and resonance of great photography or great writing. Anyway. So, this paragraph that I quote below. Wow. I wrote a brief thought here about four years ago on the whole ‘make-or-take’ question in photography. I have SO wanted to expound on that theme in greater detail and with a little more of a critical voice. So to be clear, I don’t ‘make’ images, in the Ansel Adams or National Geographic way of thinking. I don’t plan and calculate or place myself in carefully chosen positions waiting for all the perfect elements to fall into place. So I find now that, at least in the words of Neil Selkirk, the only photographer to have printed her work since her death, Arbus and I have this one thing in common. I am trying to show the world what I see and where I’ve been, and I don’t give a damn and never have about ‘making’ images. Over the course of the last two months, in mostly confused ways that were neither well thought out nor very efficient, I’ve tried to get the following information out and in front of the public. I say confused because of the dizzying panoply of emotions and concerns I’ve experienced since being awakened to the news that a hashtag and the phrase ‘me too’ had become a singular viral moment of empowerment for women in their fight to free themselves from the sexual predations of evil men as well as the mechanisms of power, intimidation, and control that have too long silenced their ranks and allowed all of us to ignore the vast size and scope of their problem. One thing I’ve learned about myself in the last 6 weeks is that I don’t know how to do something very well that I’d always thought I was probably pretty good at. That would be getting my message out there and into the hands of anyone who might need to hear that message or spread it for me. Maybe if I had truly possessed the courage of my convictions, I would have been at least consistent in my efforts. But I was not consistent and whatever courage I might have was tempered by deep concerns and reservations about attaching my name and any role I might have played in sparking the idea of the #metoo moment to this now massive world-wide phenomenon. I will relate only one concern here, out of scores of more personal concerns. I haven’t wanted to do anything that would slow the momentum of the #metoo movement, anything that might stop one solitary girl from using the hashtag as a means of speaking out about her personal situation, or anything that might change the global conversation from the message of #metoo and the impact it’s had in allowing women to fight back against the scourge of sexual predation as it exists in far too many of their lives. I have a beautiful wife who I’ve been with for 42 years. She is a working woman. A good portion of my entire adult life has been spent calculating on a daily and granular level what I might need to do today or tomorrow or twenty years from now to keep her protected. The sexual revolution that #metoo represents is something that, for me, indicates a hoped for future where women and girls might be safer to move through this world, either walking down a street at night or through the corridors of their careers, without requiring a man to act as their personal guard dog. I’m going to post a series of screenshots. Please pay particular attention to the dates. Also feel free to click on the images for full sized versions. 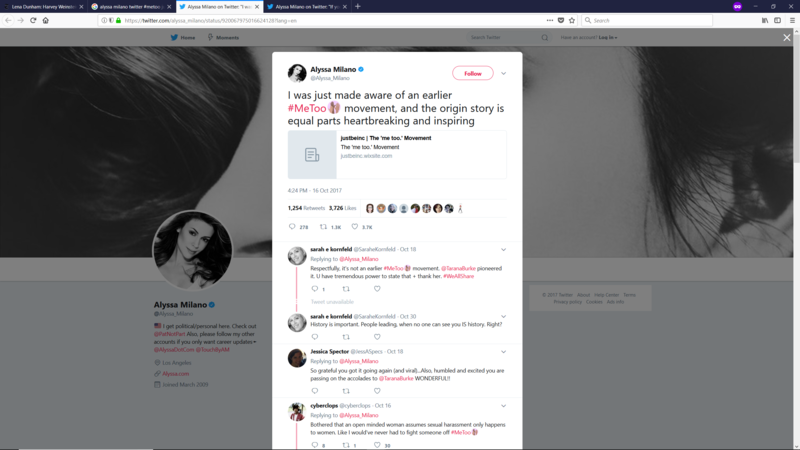 A little over 27 hours later, on Oct 16th, Ms. Milano tweets that she was “just made aware of an earlier #metoo movement” and links to a website that tells the story of Ms. Burke’s prior utilization of the phrase ‘me too’ in relation to the sexual assault of women or girls. 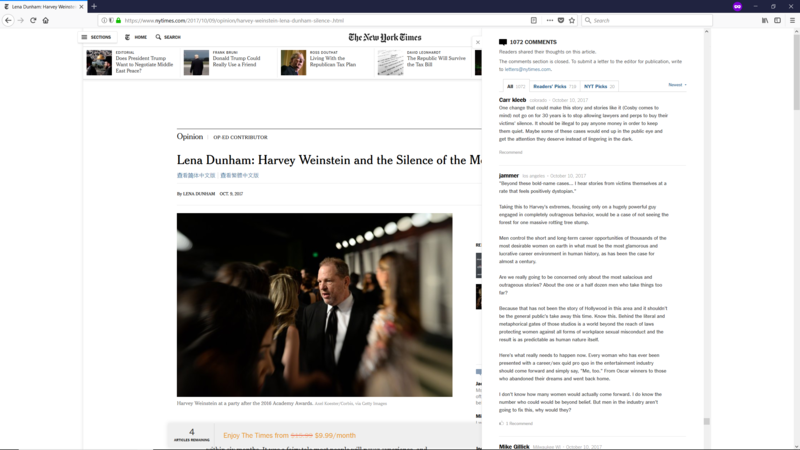 The next two screen shots are from an article and a comment to that article on the New York Times website. I will excerpt from the comment below but if you wish to check the actual screen shot you may need to click on either of the images as the text as posted in the body of this piece may be too small to read. The article is from Oct 9th, was written by the actress Lena Dunham, and is entitled Harvey Weinstein and the Silence of the Men. The comment on the right was posted on Oct 10th. It was written by me, posting under the username ‘jammer,’ five days prior to Ms. Milano’s first ‘me too’ tweet. Here is the relevant part of my comment. In the days following the online explosion that #metoo became, articles identifying Tarana Burke, based on her earlier use of the phrase in this context, as the person behind the hashtag phenomenon were published by The New York Times, The Washington Post, CNN, Buzzfeed, Al Jazeera, The Boston Globe, Elle, and The Huffington Post among many others. I don’t want to, nor can I, take anything away from Tarana Burke. She came up with this phrase and used it in this context nearly a decade before either me or Alyssa Milano. She is an actual activist and not just a person like me who suggests things online. And she is the perfect voice to lead the worldwide army of women who have taken up the fight to free themselves from this most wretched behavior that has long been forced upon them by men and the power structures men have created. Tarana Burke is essential and irreplaceable as the face, voice, and leader of the movement that is #metoo today. But Ms. Milano’s tweets clearly indicate that she didn’t get the idea for #metoo from Ms. Burke and that she knew nothing of Ms. Burke’s prior use of the term ‘me too’ in this context when she set off a worldwide movement with her first #metoo tweet on Oct. 15th. And let me say this very clearly. I too had never heard of Ms. Burke or the use of the phrase ‘me too’ in this or any context remotely like this prior to making my own post advocating women coming forward behind the phrase in my comment to the Dunham piece on Oct. 10th. Alyssa Milano’s initial ‘me too’ tweets on the 15th and 16th of October say two things. Tweet 1. This is not my idea. Tweet 2. I did not get this idea from Tarana Burke. Tarana Burke did not launch the #metoo movement that rocketed around the world beginning on Oct 15, 2017. She certainly first thought of the idea of using the phrase in a similar context and did create a ‘me too’ movement for victims of sexual assault or harassment to respond to each other and she may be now one of the present movement’s most perfect representatives. But Ms. Burke’s ‘me too’ efforts of the last decade were likely unknown to anyone even tangentially connected with sparking the post-Weinstein #metoo movement and were materially different in both the specific purpose of the effort, its overall scope, and its implementation. The person who launched #metoo is clearly Alyssa Milano. She created the hashtag, she placed herself, a working Hollywood actress, and her career, behind an idea and, by her own account, unwittingly, at the forefront of a movement. And it was her celebrity Twitter account and her tens of thousands of Twitter followers who took the hashtag and began the process of making history with it. Ms. Milano states in her first tweet on Oct 15th that she did not conceive of #metoo herself, that the idea came to her as a suggestion from a friend. And in the second tweet the following day, on Oct 16th, when the #metoo hashtag was already a global phenomenon, Ms. Milano clearly says that she had only then just heard of Tarana Burke’s prior use of the phrase in this context. Further, the New York Times reports in their Oct 20th piece on Ms. Burke that Ms. Milano said “she had been unaware of Ms. Burke’s campaign” when she first tweeted about #metoo. So ‘me too’ was not Ms. Milano’s idea. Her initial #metoo tweet says, “suggested by a friend.” Taken as a conceit this statement is true, the person who suggested ‘me too’ IS sincerely a friend to all women who have suffered sexual abuse or harassment, that I can promise you. But if the statement was meant literally then there are many questions and issues that need to be answered and clarified by Ms. Milano. When I’m on the New York Times, of which I am a subscriber, there is a popup ad that says something about the paper always seeking the truth. I’m sure the Times and all the publications who missed or downplayed the significance of Ms. Milano’s own tweets regarding the origins of #metoo do always seek out the truth and to inform the public by passing along that truth to their readers. It’s an incredibly important function. In the world and country we live in now it may be the single most important function of any of our failing institutions. But in this case, the truth is that the Times and a host of other first-rate publications failed to get to the exact truth behind the #metoo phenomenon and to get this movement’s origin story right. Details matter. Our shared understanding of a vital press revolves around the notion that facts are checked and rechecked and details are questioned and looked at from every possible angle in order to determine what exactly are the factual details that will constitute an accurate and truthful narrative. The Lena Dunham piece was among the first wave of articles on the Harvey Weinstein scandal published in the Times. This was at a moment when everyone remotely interested in this slowly breaking story, and that included, if reports are to be believed, most everyone in the entertainment industry, would have been, as I was, devouring every word published in the New York Times or anywhere else where this story and its many sidebars were being published. And as just about anyone who is regularly consuming news or political information on the Times knows, the comments sections are usually a must-read extension to the news or commentary in the main articles. So here is my truth. What I believe happened is that a lot of people in Hollywood read that Lena Dunham piece, and the comments section, and someone saw and read my comment and somehow my suggestion made its way to Alyssa Milano. Here is something, just one of many things, that supports that conclusion. Ms. Milano states that her purpose in calling for #metoo was to get an idea of how many victims were out there. I don’t know how many women would actually come forward. I do know the number would be beyond belief. Me too? This is what needs to happen now? A shared reason for ‘me too’ stated by Ms. Milano and alluded to by me being to get an idea of the number of victims that are out there? As coincidences, these are simply not believable things. The truth here is fairly plain. 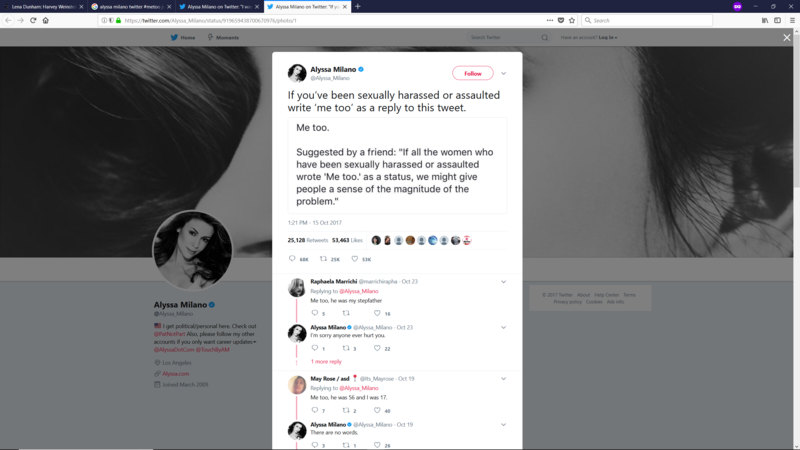 Either directly, by reading my comment herself, or indirectly, by having the suggestion I made passed on to her by ‘a friend’, Ms. Milano got the idea to call for ‘me too’ from my comment to the Lena Dunham piece, posted five days prior to her first tweet, calling for the exact same thing to happen, now, and for essentially the same reason. Ms. Milano, much younger and more social media savvy than me, and with much more to lose by taking up the fight against sexual predation with a major Hollywood scandal yet unfolding, added the hashtag and her celebrity status and thousands of Twitter followers. It takes a number of things to start a proper fire. Fuel, accelerant, oxygen, and a spark. And then five days later, whoosh! That very idea is now a worldwide movement. #metoo is now completely unstoppable and both Tarana Burke and Alyssa Milano are able representatives of a worldwide movement. I do feel that now gives me a measure of freedom. I can’t hurt this movement or take anything away from it by now pointing out that a 60-year-old man might have been a catalyst in the creation of this landmark moment for women. It’s a good thing. I wasn’t one of Lena Dunham’s silent men. The fact is that the idea that women who had been preyed upon by men in the entertainment industry should come forward and say so simply by articulating the words ‘me too’ was, in the passing moment of one more political story of a busy week, what I’m sure I would have thought at the time just one more clever idea thrown out to the world never to hear back from it again. Alyssa Milano says, in today’s POTY article that she posted the idea of #metoo “almost on a whim.” Not exactly the same thing for me but being perfectly honest with myself, it really was just one more thing I had to say on the internet that day. What has happened since has left me, in turns, reeling, elated, at times deeply moved and proud, but, again, to be honest, often unsatisfied and unsettled at the same time. My wife and I sometimes groan when someone describes a personal experience as surreal. I don’t think we’ll be groaning about that any time soon. The #metoo movement is now historically important. That women have this tool now to unite their voices to fight what has been their burden throughout history is deserving of every possible moment of recognition. But the origin story is also important. We can’t pick and choose which origin story best supports the most helpful narrative going forward. It doesn’t work like that. Or at least it shouldn’t. Okay, if you’ve read this far I’ll give you a bonus thought. It’s representative of the extreme reservations that have had me sitting back mostly in silence for the last six weeks. Remember Romy and Michele’s High School Reunion? It’s the story of two ditzy underachievers who have to face both the mean girls and tough questions at their high school reunion. I don’t want to be that. It’s a grave concern of mine. And I’m afraid that when I hit ‘publish’ on this piece, it’s going to be much worse than that. But there’s a world of women out there, especially in the field of entertainment, who have shown a bravery in the face of the power to destroy them that inspires me. * (note) This blog post will be edited in an ongoing effort to make the writing clearer or to add pertinent facts or information or clarifications as I deem necessary. The title has also been tweaked or changed entirely a number of times and might be again. The artists are spray-painting professionals, paid modest fees, and not graffiti vandals. Louise Jones set up last week with her eye on the mammoth task of painting two grosbeaks on a stone-hard canvas 70 feet tall and 100 feet wide — the wraparound sides of a church on West 149th Street off Amsterdam Avenue. Ms. Jones is so accomplished at her special art that she arrived as a fully certified operator of a powered lift-boom she uses to extend her eye and hand 100 feet high. No art form lends itself to current events as immediately as photojournalism. The greatest photojournalists are on the front lines of history, creating iconic images that shape the interpretation of those events.